Just because you’re a little less mobile than you used to be, there’s no need to think that you can’t get around and enjoy an active, full and independent lifestyle. If you use an electric wheelchair at home, you already know how useful they are to get around your house and local vicinity, plus the convenience of having in-home power wheelchair repair at your fingertips. But if you’re looking to go further afield and cover more of a variety of terrains you might be looking to transfer to a power scooter for longer distances. We take a look at some of the best mobility scooters on the market to help you get the very best value for money and stay on the go. Before you get stuck in to the task of picking your scooter, it’s worth spending some time deciding on which features are going to be must-haves and which you could do without. Do you need it to be lightweight and foldable, have a lighter steering mechanism or have a lot of room to store groceries and carrier bags? Make a list of everything you’re looking for and a budget that you’d like to stay within before you start your search, to help narrow down your search parameters. This is a tough cookie and can get across even rough terrain on its heavy-duty tyres. With great suspension, a roomy basket and the ability to be disassembled and reassembled with no tools, this scooter is a great option for packing on holiday if you’re planning on doing a lot of sightseeing. This three-wheeler is mid-price in the range and is lightweight and easy to steer. It’s perfect for shorter distances over more even terrain and features great manoeuvrability in tight spaces. It can be easily disassembled and even features a drinks holder for your coffee on the go. This extremely light scooter is perfect for taking with you in the car. It’s quick connect battery means it can be put together very easily and is super light to transport. At the lower end of the price range, it’s a great standby to have. There are plenty of options out there for all manner of styles and budgets. It’s just a case of finding the scooter that gives you exactly what you need. 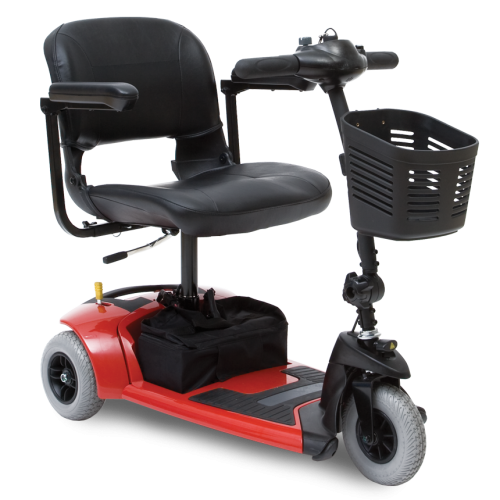 Whether you’re planning on taking a holiday and need some mobility options or just need a little more power to get to the shops and back, just a little research will help you find exactly the model you need. There’s no need to give up your independence just because you need a bit of extra support. Treat yourself to a device that gives you the freedom to roam and explore, whether that’s a lightweight three-wheeler or a heavy-duty all terrain scooter, get your scoot on and look forward to staying independent and free for many more years to come.